So as you know I have a ton of frozen berries in my freezer and very little space. Well, I got sick of berry smoothies so I decided to make a topping for pancakes and ice cream. After experimenting here’s what i came up with. In a saucepan bring together water and sugar to a boil. 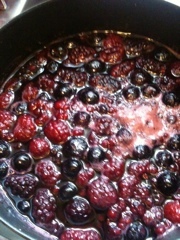 Add berries and wine, again bring to a boil. Then turn down the heat and simmer it for about 5 minutes or so. Scoop out the berries and smash them up keeping the juices. Return the juice to the saucepan. Bring to boil again and simmer until reduced to about 1 cup. Let it cool and you can keep this in the fridge! Pour over ice cream or your desired dessert! !